It is with great sadness that the family of Trella Ebner announce her passing on June 6, 2018 at the age of 81 years. Trella was born on May 3, 1937 in Peoria, Alberta, the third child of Dorse and Carrie Prosser. She had a very happy childhood growing up on the family farm. She attended Canadian Union College in Lacombe, Alberta and met Karl in the spring of 1955, they fell in love and married on October 10th that same year in Peoria. They moved around a bit the first few years and then settled in Fort St. John, BC to raise their family. They had two children, a daughter Kim, born in 1957 and a son Gary, born in 1958. Trella worked at the Fort St. John hospital for many years as a lab assistant. She loved her job even when it was poking people with needles all day. Trella and Karl enjoyed travelling to many spots around the world, their favorite place being New Zealand. In 1991, they retired and moved to Logan Lake, BC. Trella suffered an aneurysm shortly after retiring and after her recovery enjoyed making beautiful cards for her family and friends. She loved to play cards and games – her favorites were poker (because she usually won) and Tri-Ominos. Trella and Karl were devoted to each other for over 62 years of marriage. We are blessed and inspired by the love and care they had for each other. Trella was predeceased by her parents, Dorse and Carrie Prosser, her brother Ernest Prosser, and her sister Gladys Currie. 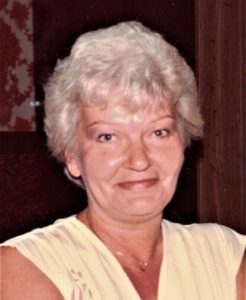 She is survived by her husband, Karl, daughter Kim Wood (Chris), son Gary Ebner (Barb), four grandchildren, Neil, Heather, Cory, Geoff, six great-grandchildren and several nieces and nephews. Mom (Betty Tannant) called to tell me about Trella. Please accept our sincere condolences, no words can describe how sorry we are for your loss. We wish you all the best at this very difficult time!